With their project “Floskelwolke” (i.e. 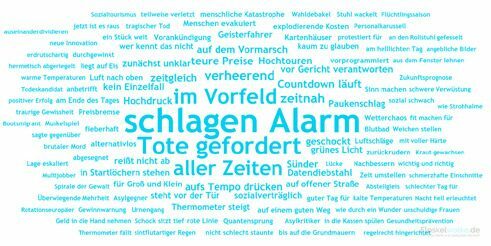 Phrase Cloud) the journalists Udo Stiehl and Sebastian Pertsch draw attention to deficiencies, mistakes and manipulation in German news language. Mr Pertsch, Mr Stiehl, what exactly is the “phrase cloud”? Sebastian Pertsch: The phrase cloud is a ranking in the form of a so-called tag cloud, which we publish online and analyze daily. The list currently consists of 139 phrases whose mention we count at the websites of some 2,000 German-language newspapers, radio and television stations and magazines using an automated search. The more often a phrase is used, the larger it appears in the tag cloud. What sort of phrases are these? Udo Stiehl: They’re hackneyed figures of speech like “grünes Licht” (green light) or “Weichen gestellt” (set course), misleading or factually inaccurate formulations like “Datendiebstahl” (data theft) – you can’t really steal data, only copy them. Or the phrase “aller Zeiten” (of all time): a formulation such as “der größte Betrug aller Zeiten” (the biggest scam of all time) includes the future, which no one really knows. And then there are the phrases with manipulative potential. “Das Gesetz wurde nachgebessert” (reworkings have made improvements in the law) is one such case. That an amendment leads to an improvement is an assertion, which has no place in a neutral report. Why do you collect these phrases? S.P. : Because they have no place in news texts. In the end it’s a matter of representing the facts as precisely and objectively as possible. And here these phrases are rather a hindrance. They either seem dubious, obscure or in the worst case have a misleading and manipulative effect. We would have no difficulty doing without these phrases. And with Phrase Cloud you want to hold up the looking glass to your colleagues? U.S.: We want at least to raise awareness about the issue. Actually it’s part of journalistic training to make use of such phrases sparingly and with full awareness. But for us basically it’s not about pillorying individual colleagues or media or uncovering defects of craftsmanship. For us much more important was first of all to establish the facts: this or that phrase is for this or that reason problematic and is nevertheless still often used. We hope of course that our colleagues will take this to heart and perhaps scrutinize their own use of language. S.P. : Very well, as a matter of fact. We get plenty of feedback, also through Facebook and Twitter. Surprising for us was especially that we were very soon noticed not only in a professional journalistic context, but also by readers and viewers. A very exciting discussion culture has now established itself. Many fans send us proposals for new phrases or give us important suggestions for our so-called “news poison cupboard”. This is a glossary in which we explain why we hold which phrases for problematic. What are examples of some of the suggestions? U.S.: The other day we had a very interesting discussion about the word “Super-GAU” (ultimate MCA; in German an acronym for “größter anzunehmenden Unfall” – biggest conceivable accident). We had put this in our list originally because we were convinced that an intensification of the “biggest conceivable accident” made no sense. An expert set us straight. We then deleted the word from the list. Can we really dispense entirely with such phrases? S.P. : at least as far as news language is concerned we can say: yes, it’s actually possible here to write almost without such empty phrases. But of course in other contexts these phrases play a decisive role – for example, in moderation. The innocuous phrase ensures understanding and makes reading or listening easier. It’s not hackneyed phrases as such that are problematic. On the contrary, they’re an important part of our language. Unless, that is, they are factually false or manipulative figures of speech. U.S.: Yes, of course, such phrases really have no place anyway. It’s actually a question of discipline, of not accepting uncritically terms that are launched with a very specific intention. The press offices of political parties, for example, come to deliberate agreements about specific wording. Take the so-called “Preisbremse” (price brake), which suggests stable or declining prices, but at the same time often obscures that a price rise will be only delayed. Why is it evidently so difficult for journalists to dispense with hackneyed phrases? S.P. : One important factor is surely increasing work stress. Many editorial staffs are becoming smaller and smaller, and yet everything must be done in the same time as before and with the same quality. Naturally errors creep in. Another reason is perhaps that there are fewer and fewer agencies for news only. Today journalists are expected to be able to use all media and formats. This often leads to them finding themselves suddenly at a news desk and in a language world in which they are unsure of themselves. You focus on the German-speaking world. Would the Phrase Cloud also work in other languages? S.P. : That’s a really interesting question. As a matter of fact it seems that other languages are far less susceptible to empty phrases than is German. The possibility of forming synonyms is by no means as pronounced as in our language. Alone the combinative possibilities of compound words in German are multifarious. Perhaps for these reasons the news language of other countries is vastly different. U.S.: To our colleagues in France, for example, our strict German news language is pretty strange. In France the news is usually moderated. The Phrase Cloud as we’ve conceived it probably wouldn’t work at all there.